For HK Style Snap Hooks And Mash Hooks. Also Fits The Remington TAC 2, 1100 & 1187. 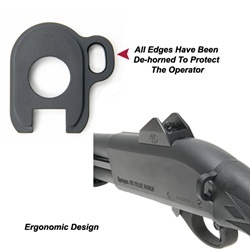 Single point slings using HK Style snap hooks and mash hooks attached to shotguns such as the highly regarded and widely used Remington 870, have become very popular in both military and law enforcement special operations circles. Because of the lack of an alternative method, most shooters have just clipped their single point sling into a standard sling swivel. Although this works, it is noisy and provides a loose and sloppy sling attachment. GG&G has developed a great lightweight and rugged alternative to clipping into the standard sling swivel, the GG&G Remington 870 Shotgun Single Point Sling Attachment for HK Style Snap Hooks and mash hooks. This rugged sling attachment will also fit the Remington 870 TAC 2, 1100 and 1187. Precision machined from rugged 7075 aircraft grade billet aluminum alloy and Type III hard anodized matte black per mil-spec, it has been designed for the rigors associated with professional use. All edges have been de horned and softened for the shhoters safety. The Single Point Sling Attachment can easily be installed by the operator. A dual point sling system can also be employed with this attachment. This is a great addition for the professional Remington 870 tactical shooter. GG&G AGENCY SLING ATTACHMENT, LOOPED / AMBI.